Army Robots: Will Humans Still Be in Control? Is the day approaching when the U.S. military can deploy a robot that can drive itself around a corner, use senors to detect an enemy fighter on-the-move and destroy the target instantly with missiles and machine guns  all without human intervention? The Pentagon thinks the day may be imminent and it wants to make ensure that its technology doesn’t get ahead of military doctrine. It wants to be certain that there is always a “human” making decisions regarding the use of lethal force. With some estimates of armed robots, with so-called Autonomous Navigation Systems, less than five years away, the U.S. Army is drafting a “White Paper,” to establish a set of guidelines and principles for their use. “This is a concept paper to think about warfighting outcomes and what robotics will do for soldiers,” says U.S. Army Lt. Gen. Michael Vane, who directs the Army Capabilities Integration Center, Fort Monroe, Va. “I am starting out with the idea of having an technology-enabled human. [But] we might someday come up with [separate] IT doctrine and robot doctrine.” He reiterates that “we want to make the people or humans in charge under command and control in a ‘whole of government’ approach.” The White Paper will be finished in the coming weeks, Army officials said. Thousands of 30 lb. backpack-able remote-controlled or “tele-operated” robots with infrared and electro-optical cameras are already clearing caves, building and other potential enemy locations in Iraq and Afghanistan right now. But two new robots are at the front of the autonomous revolution: the MULE and the SMSS. Computer algorithms are advancing to the point where prototype robots such as the Army’s Multi-Utility Logistics Equipment vehicle are able to cross barriers and navigate obstacles without human guidance. The MULE, a 14-foot long, six-wheeled robot equipped with a range of navigational sensors, slated to deploy with U.S. forces 2015, will eventually carry Javelin Anti-Tank missiles and M240 machine guns. The MULE could well carry supplies and conduct reconnaissance missions for light infantry units in difficult terrain such as Afghanistan. It is programmed with on-board computers so that the vehicle can find its own way around corners, up mountains and over obstacles. So far, the MULE has crossed over highway barriers in New Jersey by itself in testing. In a few years, the robot will be able to drive itself with on-board computers, navigate its way around obstacles while using sensors to beam back images of the surrounding terrain and, ultimately, fire deadly weapons on targets identified by the sensors. This last portion of the MULE’s abilities  namely the capability of using lethal force by itself upon enemies  is of particular concern for the Army. Meanwhile, the mountainous terrain and high altitudes of Afghanistan have led the Army to increasingly emphasize rapid delivery of anything that can lighten a soldier’s load. 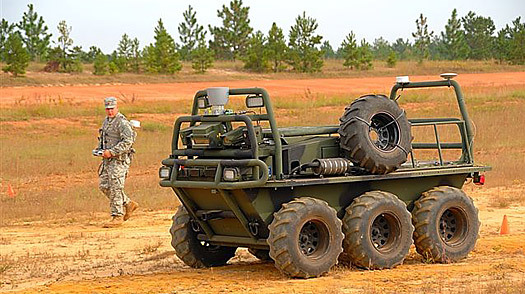 As a result, the U.S. Army Infantry Center at Fort Benning, Ga., is experimenting with a 4,000 lb, six-wheeled semi-autonomous, supply-carrying robot vehicle called the Squad Mission Support System which will likely head to the mountains of Afghanistan for testing sometime next year. All the more reason for the Pentagon to make sure humans can still climb into the driver’s seat  and tell the robot who’s boss. See 80 Years of Robots in Hollywood.